The mighty fortification in the homonymous village in Eisacktal was built in the 19th century by order of Ferdinand I. of Austria in order to protect the important connection between north and south. From 1833 to 1838 there were partly employed more than 4,500 workers for this huge military complex made of bricks from Neustift, limestone from Bruneck and granite from Pfalzen. At first sight it may seem to a confusing labyrinth of buildings, corridors and stairs, but at that time it was a logistic masterpiece. 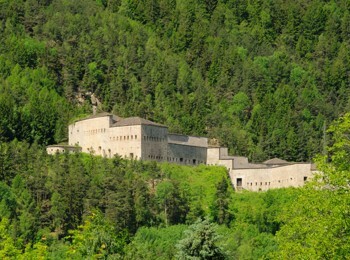 The bastion, which was named after its planner Franz I. of Austria, is about 65,000 square meters large and extends to three levels with caverns in the rocks and casernes. A constructional particularity is the intermediate “eternal staircase”. Its number of steps has never been reliably determined. In spite of its strategic position and the imposing dimensions the fortress of Franzensfeste hasn’t been finalized. It was used as arsenal, but it has never been involved in an act of war. Reputedly in 1943 the national socialist stored there an immense quantity of gold that is said to be lost. However the truth of this myth is uncertain. After the Second World War the fortification was of little importance and till the beginning of the 21st century it was military area. Today the Franzensfeste was in possession of the province and the community. In the last years parts of the complex have been rebuilt, in order to create a place for varying exhibitions and events. The fort can be visited. Depending on the season guided tours are offered weekly or daily. Individual appointments are possible on request.